Beautifully designed by Laura Lovett, Chronicle Books's latest clever gift box brings together reproductions of 16 artifacts from man's first trip to the moon. Among the goodies are a copy of the front page of the Washington Post dated Monday, July 21, 1969, an iron-on Apollo 11 mission badge and a government handout about the in-flight menu (""a typical dinner includes beef and potatoes, butterscotch pudding, brownies and grape punch""). Each of the original astronauts also contributed personal effects for facsimile in this""museum in a box."" Neil Armstrong offered a humorously matter-of-fact travel voucher listing his trip as""Houston, Texas to Cape Kennedy, Fla., Moon, Pacific Ocean, Hawaii, and return."" Buzz Aldrin gave the little snapshots of his children that he carried with him on the voyage. Michael Collins provided maps, star charts and the""Solo Book"" he wrote in during the flight. The box also includes a small paperback book by planetary geologist Craddock, which chronicles the main events of each day of the mission. 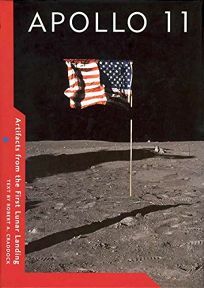 Though readers who have little previous knowledge of the landmark flight may have trouble piecing these artifacts together into a coherent record, this mini-museum, which is published in collaboration with the Smithsonian, makes a great gift for those already interested in astronomy and space exploration.